Editor’s Note: This is an updated and revised edition from earlier in 2018. 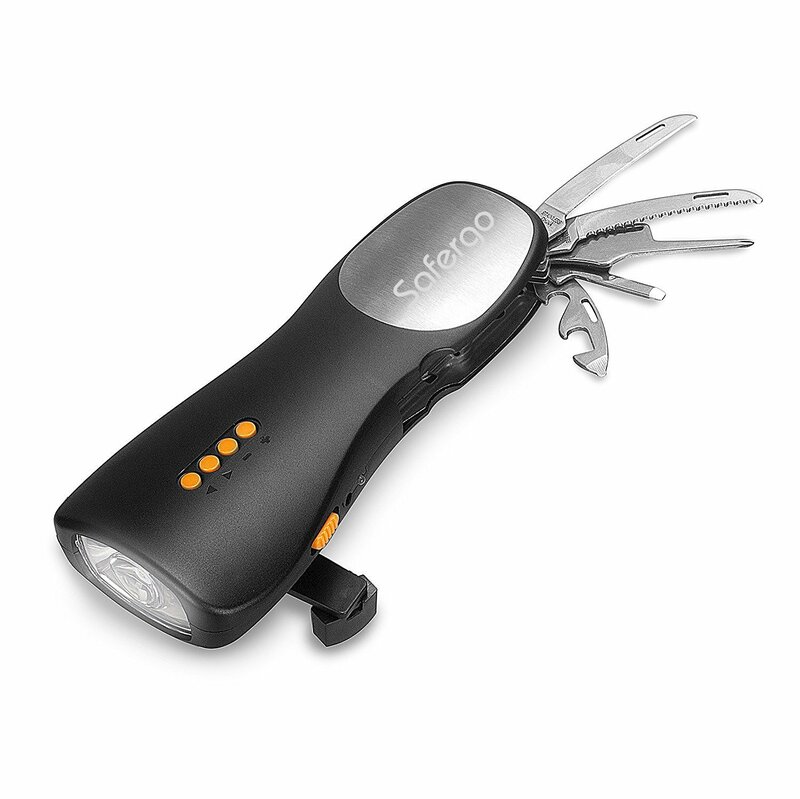 Hand-cranked flashlights offer light and other functions when out on the trail or during a survival situation. This type of lighting has come a long way over the past few years and the price point is great. 1.3 Light is important for your safety during an emergency. 12.1 Do you have a favorite emergency light? Any experience with any of the designs featured in this post? You need to look at different lights to discover their total functionality. If you are just looking for a hand-cranked light that might actually limit you a bit. 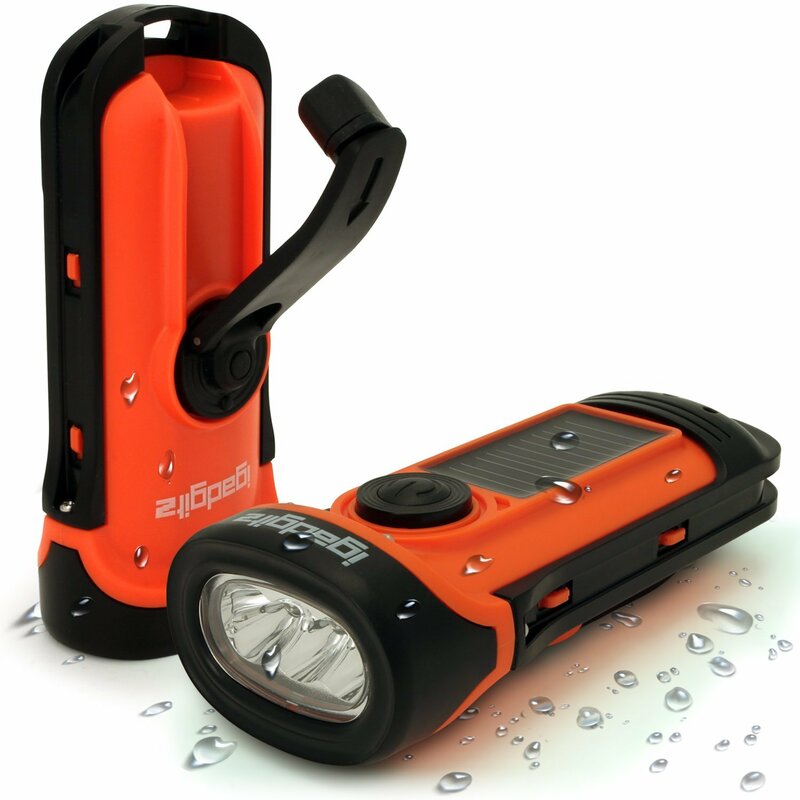 A lot of the hand-cranked flashlights on this list have one or more of the following extra features. An FM/AM radio and small speaker are built into even some tiny flashlights is common. Sometimes there is a weather radio option that is often more useful than the regular radio. Kids sometimes like the handcrank lights with a radio because they can take them a lot of places and they are inexpensive so parents don’t have to be so concerned. Being able to keep small devices like a cell phone or tablet charged during and emergency is a great thing. While these are not the most powerful chargers, they are enough to keep your phone going, an e-reader topped off, or run a small tablet a little longer. The key is to remember to start charging before your batteries get lower than 25%. Some small chargers have a hard time charging if batteries are totally depleted. Like any device, the more you add to it the more it is going to weigh, and there is the increased bulk. Sometimes the weight is not as much of a factor as how large the device is overall. Consider that you are probably going to have to crank your flashlight a full minute to get 10 minutes of light. These are not lights you want to rely in for continuous use. At the same time if you are setting around the campfire and want to listen to the radio it might not seem like much hassle to crank along. While these devices are supposed to be made for rugged use, quality and durability are going to vary. If you want one of these for regular use on your excursion, then go for a higher grade light. I am very surprised the value you get for under $30. In fact, some of the more basic lights with a low crank input and a lot of light are $10 each. This has made me reconsider the types of flashlights and overall lighting choices we have in our home. Flashlights were always a big deal around our place. When Matt and I were living in that old camper trying to build our house and farm we relied a lot on flashlights. If a flashlight didn’t perform well we tossed it. When you have little or limited power then you have to make sure lights are scattered in key areas like by the doorway or beside the bed. Light is important for your safety during an emergency. Light is critical. Without good lighting, you put your safety and well being at risk and impede your ability to take care of your family during a survival situation. Without proper lighting, you can slip and fall or cut yourself. Remember that if SHTF or there is a natural disaster you may find that you are having to take on tasks that you are not 100% proficient in. This is also a case where the odds are that your stress levels will be high. Light also allows you to at least read and write during a grid down situation too. Years ago there was a lot of sewing and other household tasks that went on after daylight hours had passed. Just setting in the dark is no fun. During the months when the days are short this can be especially bad for overall morale and health. Backup lights should be beside your bed. Make sure elderly and disabled family members know exactly where their light is. Glow in the dark decals or tape can help them locate it too. Elderly and disabled persons need to be especially careful to have some emergency lighting close at hand. There have been cases where older folks have remained in bed too long during an emergency simply because they had no light and were afraid of falling in the dark. Some of the hand-cranked lights on this list may be better than others for disabled persons or the elderly depending on their individual needs. 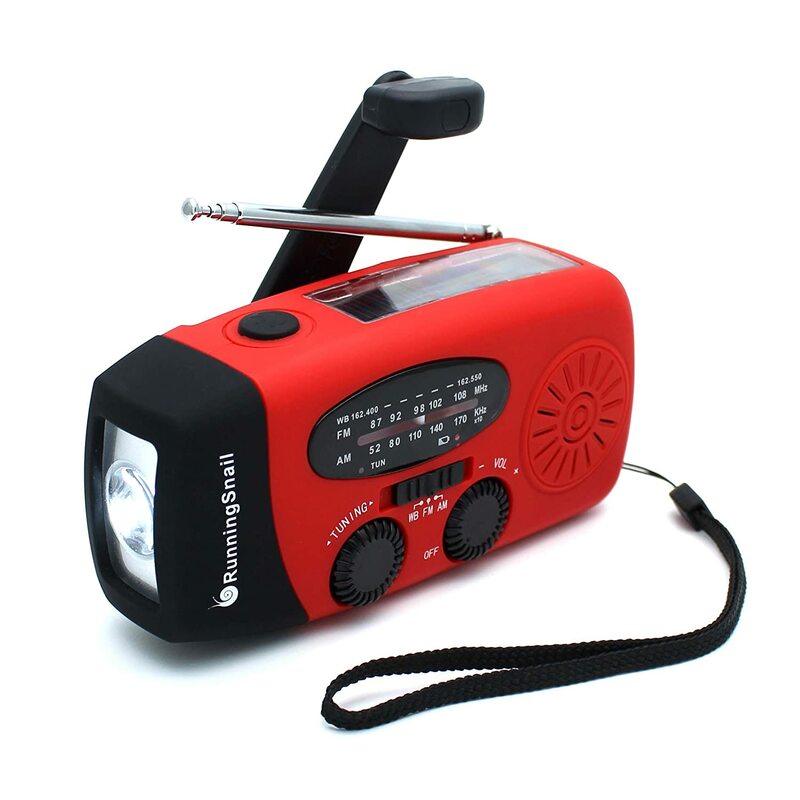 For those that like things that serve multiple purposes, there is this handy flashlight and radio combination. I have to say I like the handle on this flashlight. Unlike some flashlights on this list, the handle is more like that you find on the old-fashioned larger flashlights. The color is easy to see which can be helpful. Oh and this also has a little solar panel so during the day you can keep it charged that way and then use the crank at night if desired! 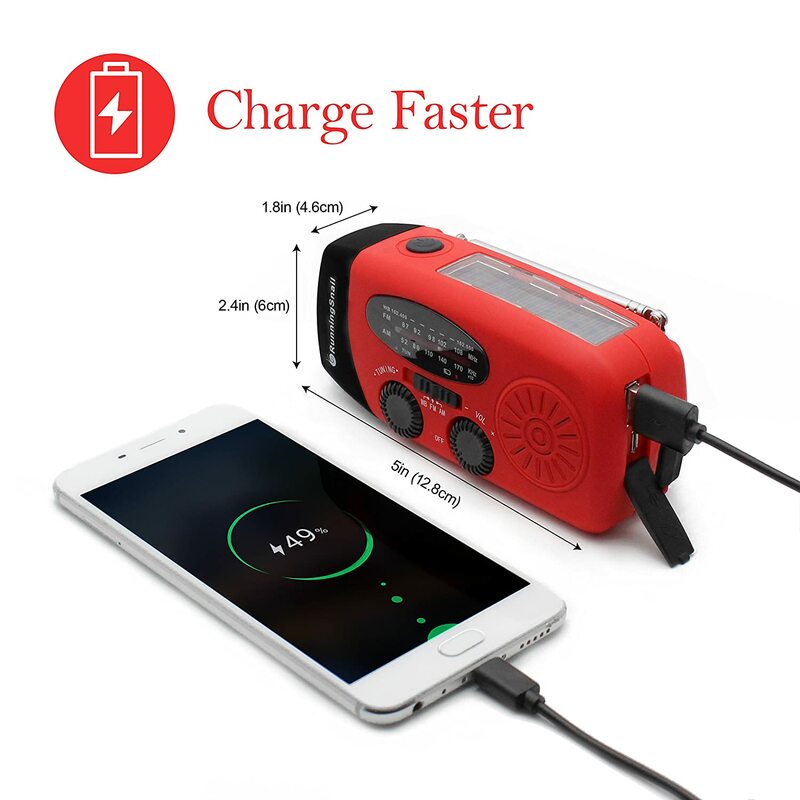 This device also is a battery bank/cell phone charge, an emergency siren, and it has a blinker function so it can get a lot of attention if you need it to. I am not usually one that likes to recommend something that has so many functions that it sounds too good to be true. A lot of the time more function means that it is not built well because the maker is trying to put too much into a small package. In this case, this seems to get solid reviews. 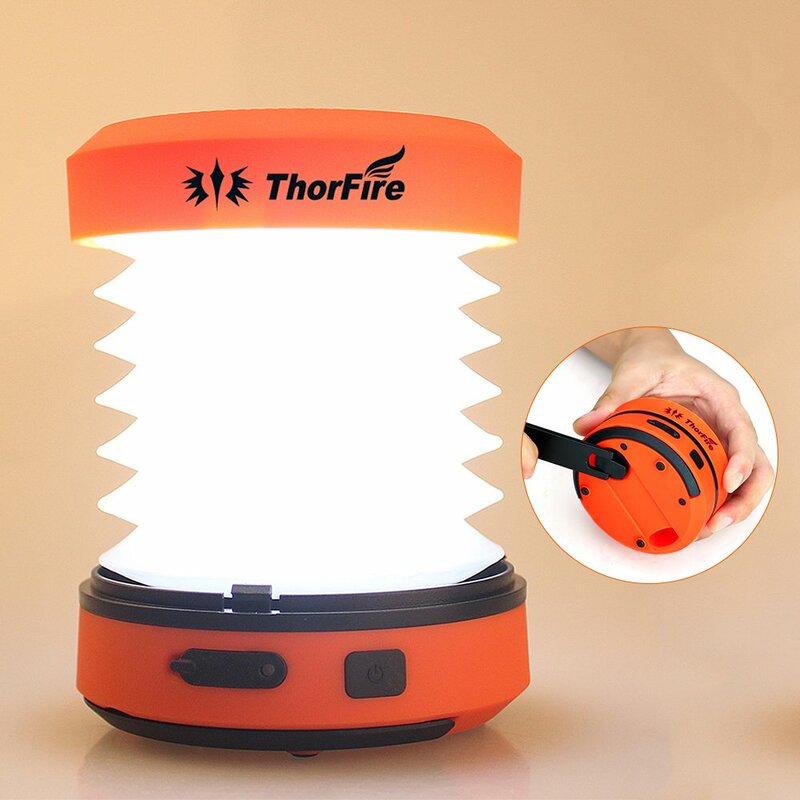 I kind of want just to order a few of these right now because I like that you can use this like a flashlight and a lantern and it gives a lot of light. This is big enough to be a good choice for beside your bed in an emergency. In fact, that seems like an excellent use to me. If you don’t want to hand crank, then you can charge this via USB, so it is easy to keep charged up in your car or by using a USB port on your computer when at home. The duel settings allows for you to choose a 13 lumen flashlight setting for when you just want a little light or you can choose the 42 lumen lantern mode. There is also a low and high setting for flashlight and lantern. So if you are in flashlight mode you would only be using 3 LEDs in low and 6 in high. The lantern on low is 6 LEDs and 12 LEDs on the highest setting. Lighting time depends on the brightness you choose and if you are cranking or have a fully charged unit via USB. 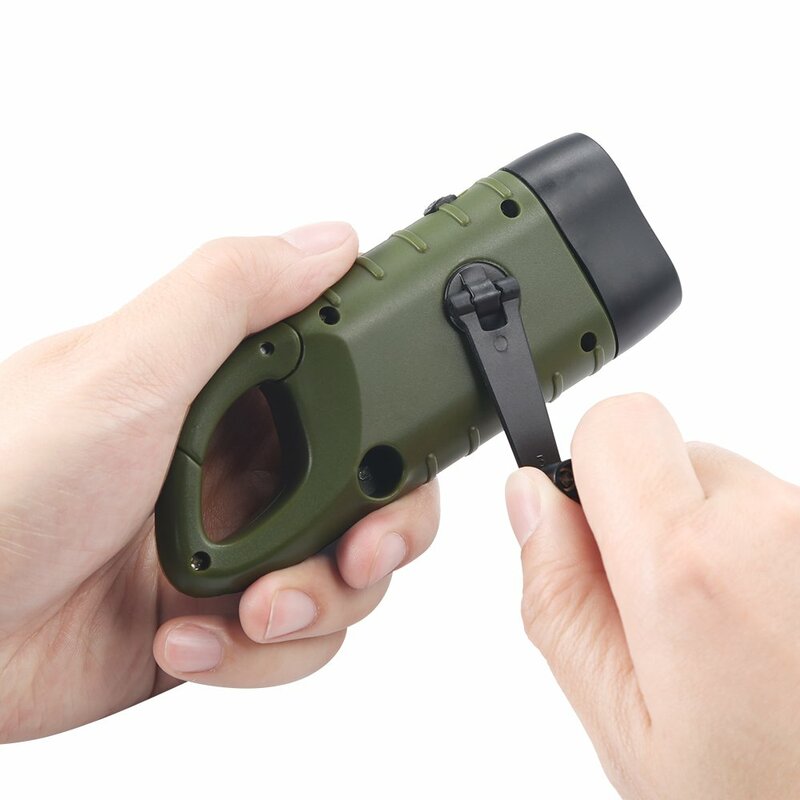 If you have no charge and are using the hand crank, you can expect to crank for 1 minute to get 5 minutes of the highest lantern setting and 13 minutes on the lower setting. If you start out with a full charge, you can get 8 hours on the low lantern setting. A carabiner clip is built in and allows for easy hanging on branches, in tents or just for attaching to your pack when you hit the trail. Best for those on a budget that want just a light but with amazing durability! These are just basic little hand-crank flashlights on the first appearance, but I have to say that they are above and beyond what you expect. These lights would come in a two pack for about $20 so if you were judging them based on the price you would be thinking how good they could be for that price? The truth is that these little lights will operate for an outstanding 80 minutes with just 1 minute of crank time. This is the best return for the work I have found in an hand-crank light. On top of that, you can charge these lights with the solar panel during the day. If you are concerned about ruggedness, then you will be impressed that these lights are built with a rugged housing, and they are waterproof to 45 meters! 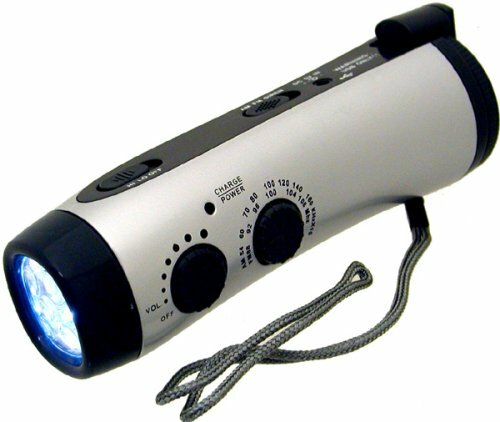 This is a good budget light to throw in a bug out bag and keep in all your vehicles and boats! These collapsible lanterns have the advantage of being lightweight and extremely compact when folded up. You could easily throw a few of these in a pack even if it seems very full. These get excellent reviews from users. I love that it is so small and will charge little devices. 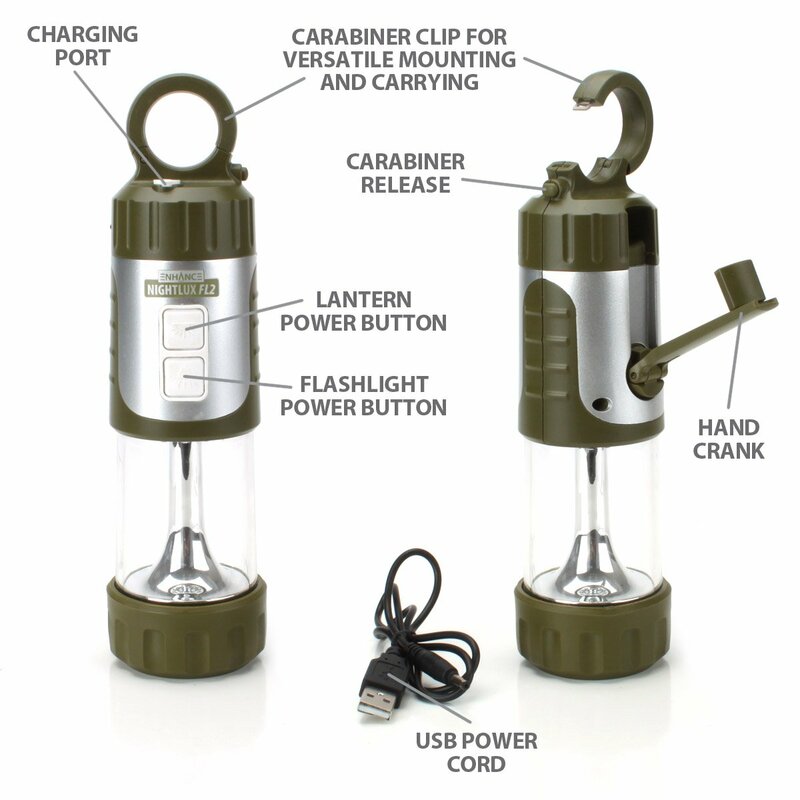 You can charge this lantern up with the crank or via micro USB. This is another lantern that the maker was smart enough to make it, so you don’t have to have a special cable or anything bulky to charge. You could keep one of these charged and in your car. The lantern would easily fit in a glovebox or any small compartment. The low light setting is good for relaxing and reading in the evening or doing other small tasks while the high setting allows for good visibility out on the trail. This can be used as a flashlight when compressed if you don’t want it in lantern mode. This flashlight has a five-year warranty which stands out to me because no other light on the list has one that long. 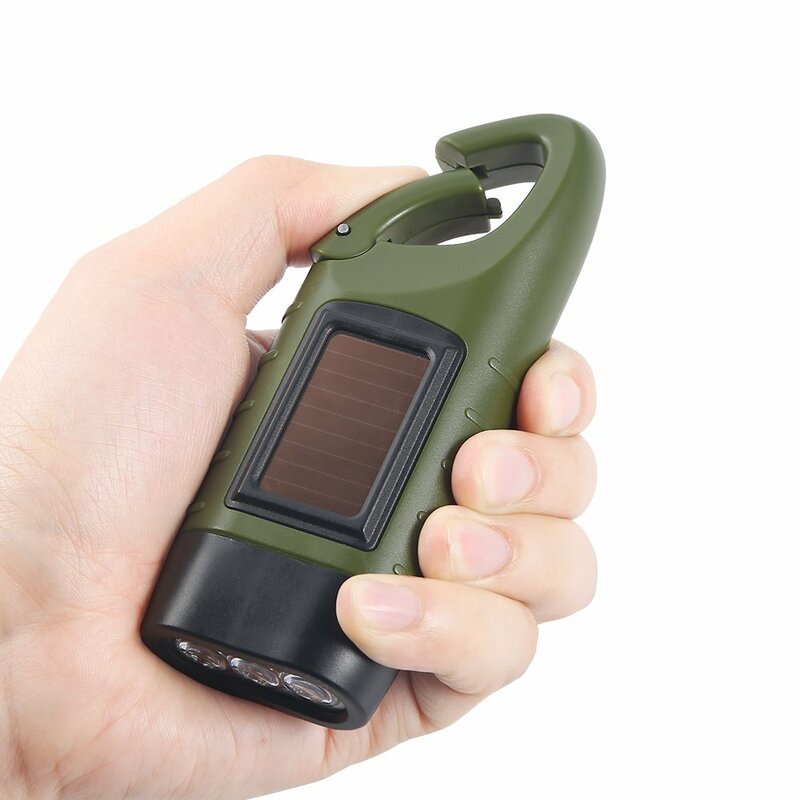 This is a larger hand cranked flashlight with a solar panel for additional charging options. It is waterproof to 45 feet, so it is a good choice for those that are on the water a lot or that want back up on their boat. 1-minute cranking provides 60-110 minutes of light depending on what light intensity setting. If using solar to charge, 1 hours direct sunlight provides 90-140 minutes of light. This one of the most efficient lights on the list and great for those that like the option of hand-cranking but want a good return. An hour or more of light is great for a minute of work. Some people say they buy these for their kids to use because they don’t have to worry about batteries and they never actually run out of light because the solar panel does a good job of keeping it topped off and ready to go. This is a solid value with a lot of satisfied customers. This is saying something when it comes to something like a flashlight where there is a lot of competition. This is a nicely built multi-purpose device for stashing at an emergency location. 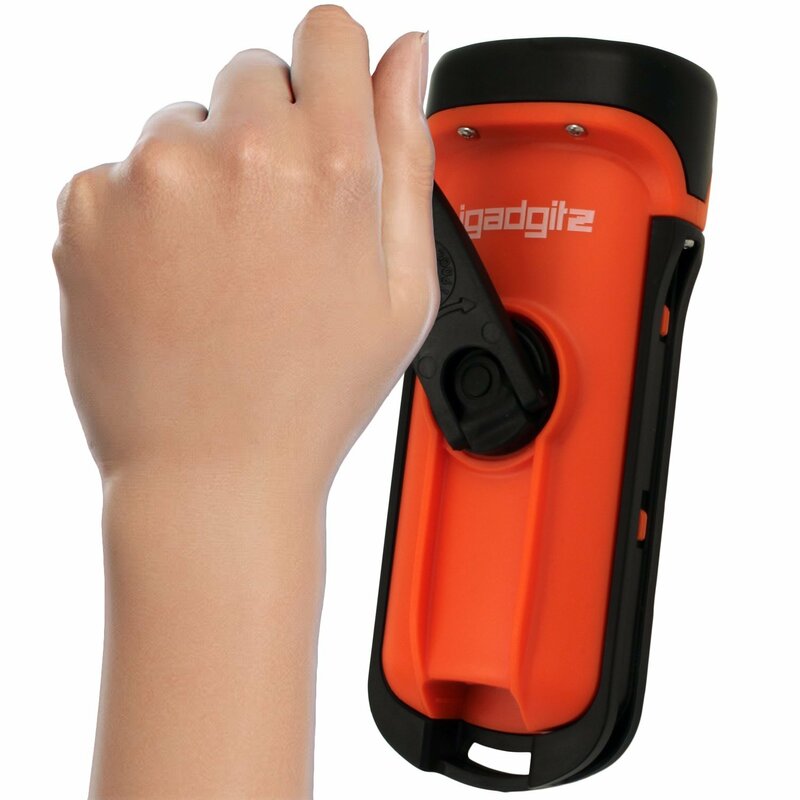 It features a solar panel for charging as well as a hand crank. I like that it is not just an AM/FM radio but an NOAA weather radio. Knowing what is coming regarding weather allows you to better plan out what you need to do during a survival situation. This can be charged via USB too, and it is a 1000 maH power bank. The small size makes it easy to stash in a pocket even! For a multi-purpose unit, this has a lot of potential for a survival situation. 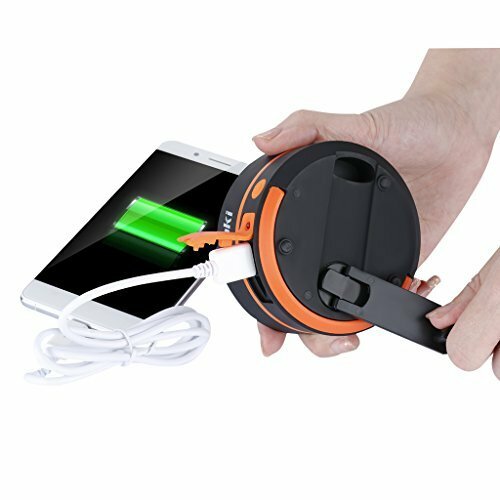 I could see throwing this in a get home bag so you can keep informed about news, weather, and keep your phone charged up. This fold-up lantern is very similar to the SUAOKI lantern shown but at a lower cost. 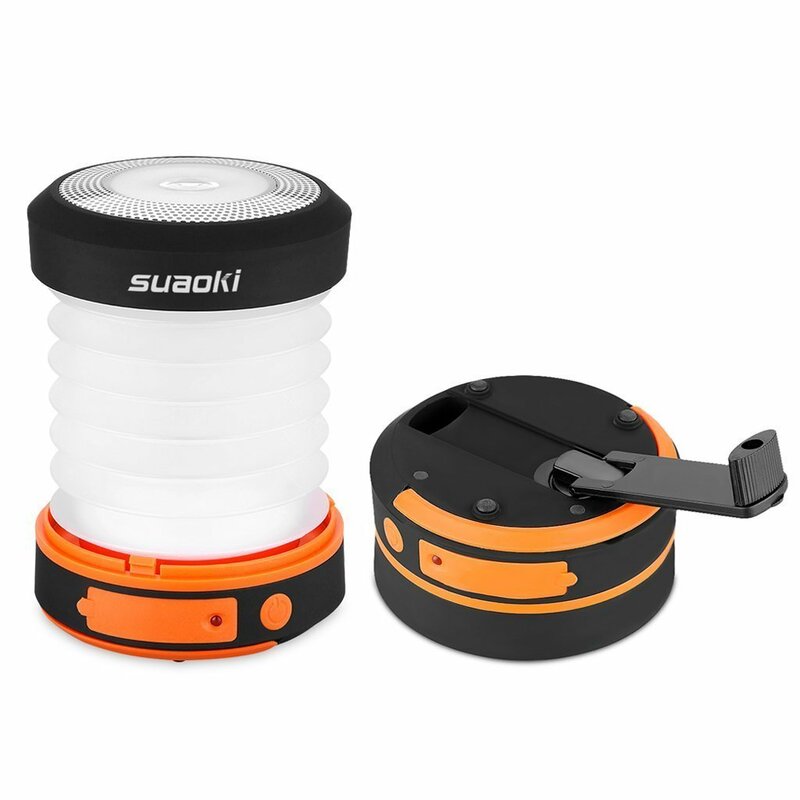 It expands to be a lantern and can be charged via USB or cranking. If you charge it on USB and take it out, you can get 4 hours of light from it without any cranking. When compressed it works as a flashlight, and you can leave it compressed and crank it to charge up some small devices. Some of the comments I read lead me to believe this will not charge Apple devices but I am not sure why it won’t. These styles of lanterns can be hard for some to open, so that is something to consider. It sounds like where most run into trouble is simply not being firm enough out of fear of breaking it. I don’t know how many of you are familiar with “The Red Green Show” that used to be in PBS and was made in Canada but this gadget makes me think of that show and how they would just take a bunch of stuff and make it into something that if it worked would be super useful. I am just always suspicious of things that have too many things going on. Sometimes I think it comes from being a kid in the 90s and seeing the frustration everyone had with CD changers. Well anyway back to this amazing little gadget. I like that practical tools are par for the course with this device. 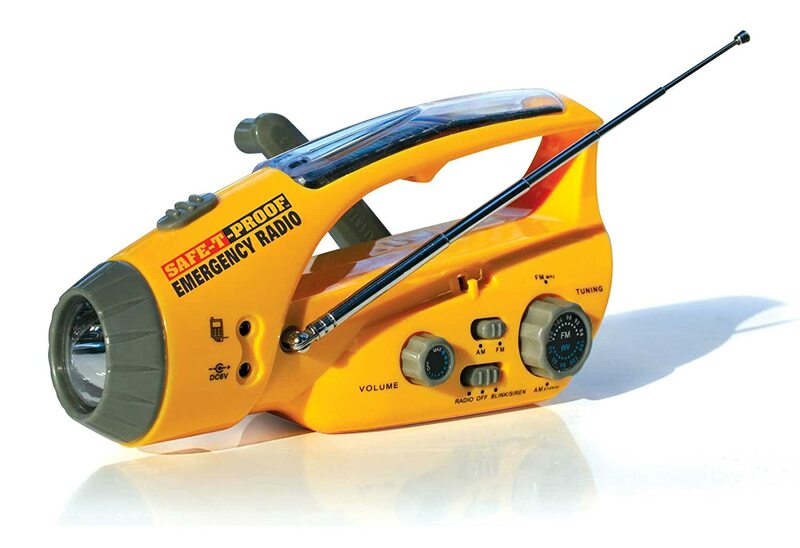 An FM radio and flashlight is great, but this one has a bottle/can opener, flathead screwdriver, knife, and seat belt cutter, and tread ruler. This is a great tool to keep in your car or get home bag. A bonus is that you can use this as a power bank with a 5V 1000mA DC out port. The info I found said that the light could run 3-10 hours on a full charge depending on the light intensity you choose. This is a lot to pack in a unit that weighs just over 12 oz! 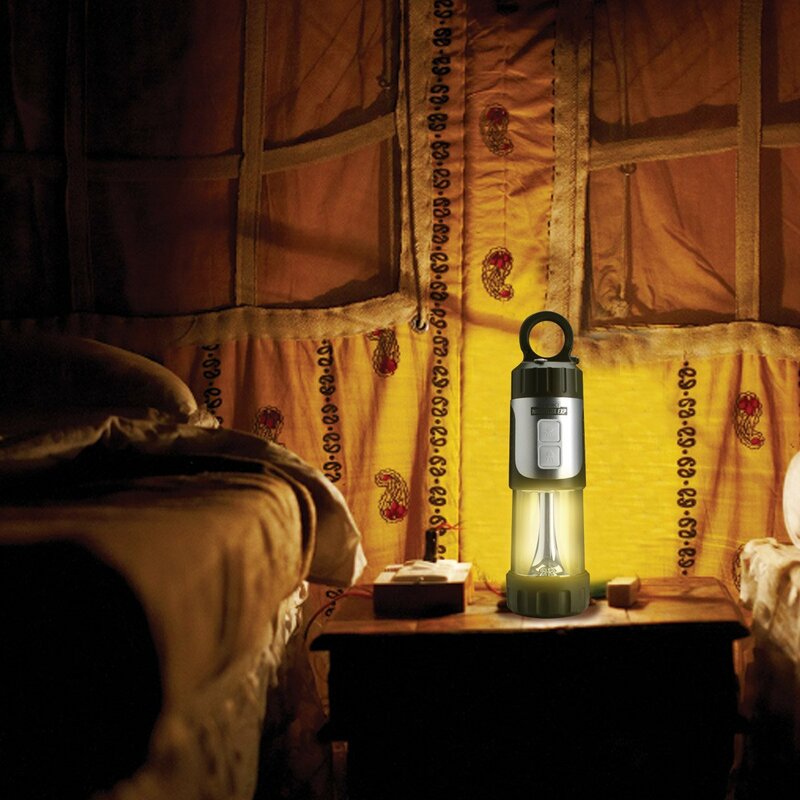 This is another affordable small light that charges with hand cranking or the built-in solar panel. The carabiner clip makes it easy to attach to packs. The small size and affordability make them a good choice for putting in a lot of different places. If you crank at a rate of 2 cranks per second for a minute, you can get 10 minutes of light. Of course, the solar panel helps keep it charged to. The maker claims that the solar panel does a good job of charging the light under indoor lighting conditions so if you have a light on, it will help keep it topped off. This struck me as being a light I should include because it is more of a classic design but also includes a radio. You can charge this via USB or hand-cranking. It is also a battery bank for charging your phone, and it comes in at under $20 at the moment. You can choose from a high or low light setting. I didn’t see much to indicate this is very waterproof or anything like that, but it is made for camping, so I imagine it is good for a little bit of water. The telescoping antennae help you get better radio reception. There are plenty of devices out there that don’t think about an antenna for reception which makes the radio useless. For those that just want a good durable light I would say go with the . These lights give you the most light for the least amount of work, and they are totally waterproof, rugged, and inexpensive enough to put in any emergency kits or stash on your boat. I also have to say that the crank time of 1 minute for 80 minutes of light is going to be a lot easier on those that have trouble with their hands. Some of the lights on my list are not the best option for those that really cannot sustain a lot of movement with their hands. For lighting up a bedroom or larger space, one of the lanterns is going to be better. Any of those that have multiple charging options are a good bet. For kids, the iGadgets and Bigfoot are the way to go because they require little work to get a lot of light. I know I would have thought it was pretty neat to have one of these for putting in the various forts I constructed! 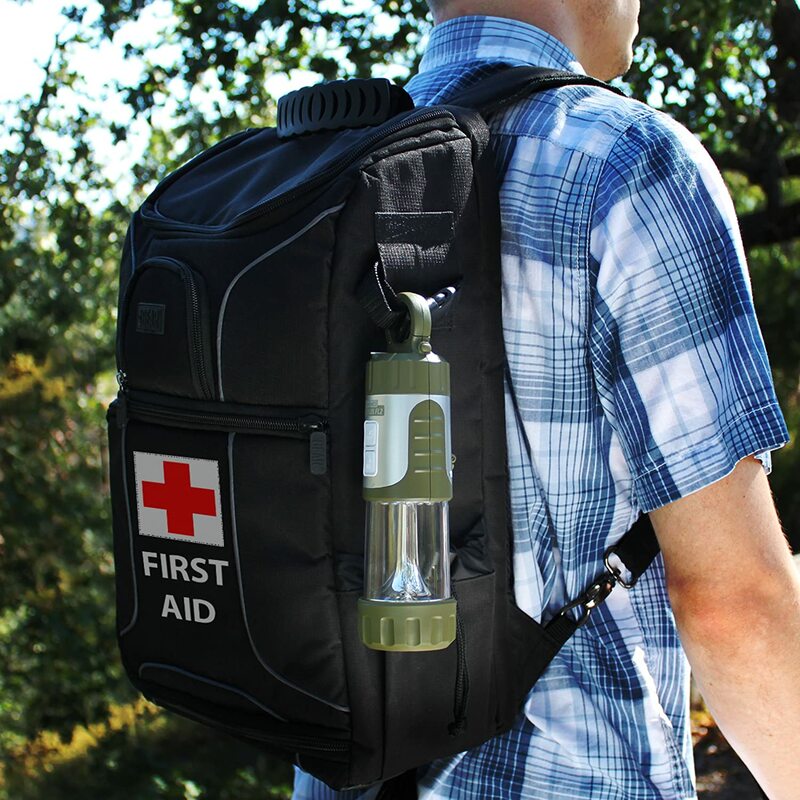 For a get home bag, I like the RunningSnail due to the weather radio that is included as well as the ability to charge up a phone. Knowing the weather when you have to travel miles can be very important. Sometimes taking shelter for a little while is the best thing to do but if you are in some areas the shelter options may be few and far between, and that means planning out your progress. Do you have a favorite emergency light? Any experience with any of the designs featured in this post? Love all these Lights and Gadgets but will they work after an EMP Attack? If it has a circuit board it will be worthless! Just Keep that in mind and make sure you have Plenty Fire Starting Flints and Outdoor Cooking Skills and know how to Distill Fresh Water to Drink and protection from the Weather like a Cave, Tent, Log Cabin or House along with Plenty of Freeze Dried Foods because it could be years before things get back to some semblance of normal or the Good Old Days before the EMP ATTACK! Weapons will be needed for Protection and Food. Anything that can Solar is Good as Long as it doesn’t have a Circuit Board in IT! This very simple short list of what will be Needed. Verse 11 the Word Beast means Ruler or Government SYSTEM = Mandatory to take Mark of The Beast = 666 in Forehead or in Right Hand or you can’t buy or sell anything. If you refuse you will either die of starvation or have your head chopped off plus if you ain’t been Saved by Grace(Ephesians Chapter 2 verses 8 & 9 King James Bible) and cleansed from all you the sins you were born with or you’ll go to Hell for all Eternity! How to be saved ask Jesus Christ to forgive you of all your sins and Save Your Soul. Then you won’t have to worry about dying. MN1 Robert Briggs USN Retired. Robert Bobby Briggs USN Retired. Just because it has a circuit board doesn’t mean an EMP will fry it. There are way to many variables in an EMP to go with that. Distance, manner it’s stored, strength of the EMP, type of EMP etc. I’ve been doing this since the 80s and I’ve lived thru a whole lot more storms, power outages, drunks hitting the poles and stuff than worrying about the incalculable EMP, where a light has been needed. I’ve got one in my camper I’ve used multiple times under various conditions including once when the batteries were forgotten. The only thing I’m going to add on these lights is that if they don’t show the strength of the light it’s most likely pretty weak. 10-15 lums is great for walking down a hallway or marked trail but more is needed for real work and operations. Wonderful article! Allot has changed since I researched this subject 6 years ago… THANK YOU Samantha! At the end of the post, you have a part that is labeled “My Choice.” The first sentence is incomplete. It says: “For those that just want a good durable light I would say go with the . ” What is your choice? Hey Karl thanks for giving me a heads up on this. 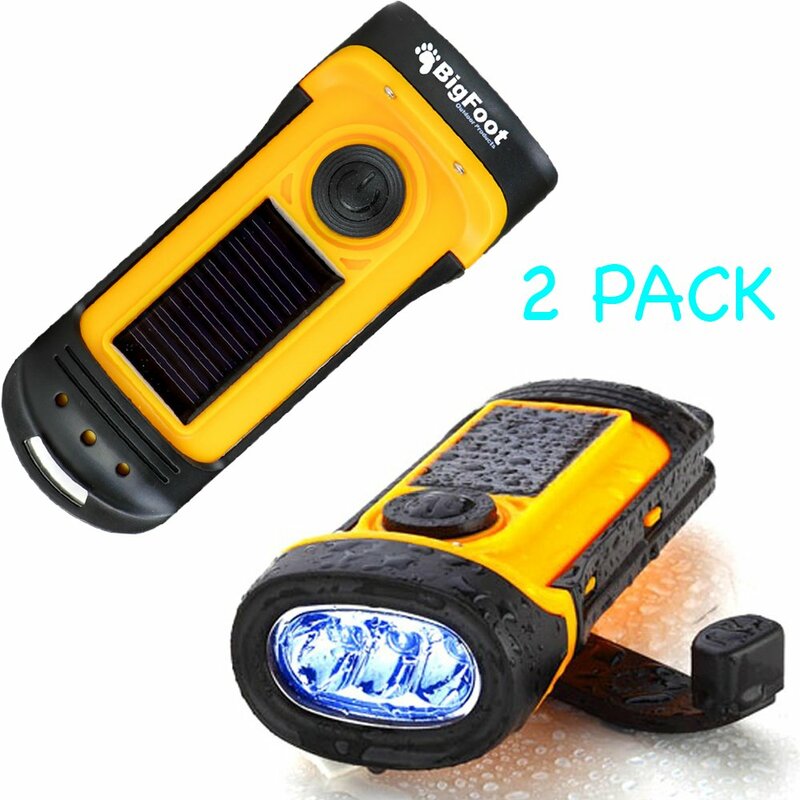 There is supposed to be a link in there to the Bigfoot Outdoor Compact Solar Camping Tent Lantern & Flashlight 2 Pack that is the third light discussed in the post. On my end it is showing up. I am looking into this. Thanks for reading! I find many simple proofreading mistakes in these articles, otherwise they are great. I don’t think Gaye does them anymore. Try the HDE batteryless flashlights. They’re only about $5 and work for the glove box or purse. Won’t last a lifetime but they’ll work. I really like that squeeze crank design! Thanks for sharing! Samantha does a GREAT job, but we sure miss Gaye! Thank you for an informative article. I find one frustration with most of these devices. They don’t have a power display. How hard would it be to add simple LED lights to show levels of charge? 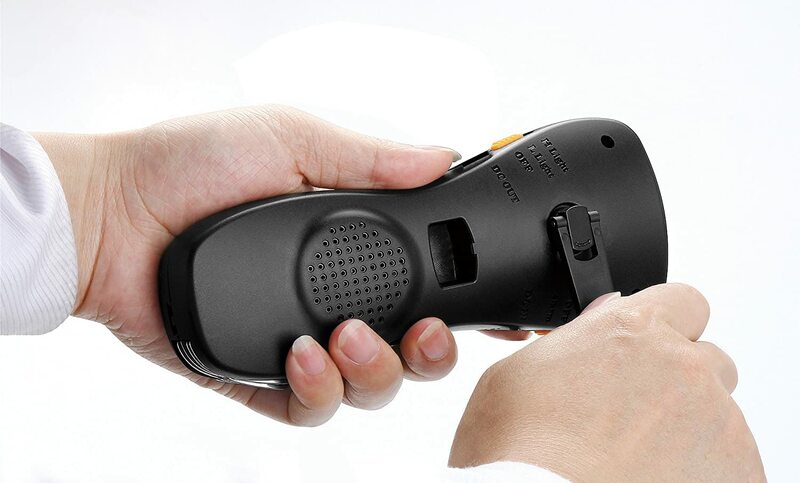 This would be good for prepping as one could easily check the power level in a proactive manner. Otherwise, all you can do is turn it on to see if it has a charge. You don’t know whether it is fully charged or on its last leg. And a meter helps when you are cranking. I sure like to know I am making progress and just how far along I am on that task. Anyone else have this same frustration with these devices? Nothing beats the old oil lamp. It is good for a very long time. Then simply refill it. You can see one at work at any Cracker Barrel restaurant. They decorate the tables with them but do not sell them. Walmart has one for about $8 when it is in stock. On the EMF I suggest you keep the rechargeable in a steel box. Like a small safety deposit box in the home. I use shop lights in the garage. A simple extension cord plugged into an inductor that works off the battery in your car works if you can run the car. A powerful one can even run a small AC Window unit for a short time. The key is to keep it to low powered units like a 5K BTU unit. Amazon carries the inductor units. IF it is an EMF Attack then just about everything electrical is possibly ruined. Any vehicle still running is likely to be confiscated by the government. Only generators with flexible fuel supplies are likely to work and only if they are shielded. The shielding is likely to be very expensive. I recommend everyone should own a small battery operated kick starter like the one Stanley puts out. Again in an EMF attack most electronics are toast. Anything at all that will run off an inductor and a spare battery short term will work for you. Long term, we are all in trouble. I strongly suggest for winter time owning a buck stove or equivalent and alternately power it with a 12-volt automobile battery. People have been known to be without power for a long time. The poor man’s choice is an inductor. Those richer might consider a diesel operated multiple fuel alternative generator. EMF kills just about everything but a wood burning stove. Last time years ago my electricity was out for about 6 hours. The wood burning stove was running when it went out. When the power came back it was still 65 degrees in the house. Try the HDE mini-hand crank flashlights. Only requires one hand to crank power to light up the 3 LED bulbs. Not terribly rugged but good for purse, glove box, and camping.